It makes perfect sense that direct vent gas fireplaces are the most purchased hearth systems today. They offer convenience and safety, with sealed combustion systems that protect indoor air quality by drawing outside air for the fire and expelling 100% of combustion exhaust and byproducts outside the home. Specialized venting includes a “direct vent” that has two chambers that work together to perform dual purposes: one chamber draws oxygen in from the outdoors for the fire, while another expels the fire’s byproducts and gases outside. Most direct vents are terminated horizontally directly through a wall, but they can also be routed through a top vent or side vent. This illustration shows how a direct vent can be routed from the firebox directly through the wall to the outdoors, and also the optional side and top venting routes. 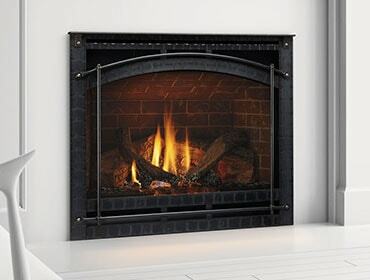 Direct vent gas fireplaces come in many designs, ranging from traditional to modern. And in addition to creating warmth and ambiance while you live there, a gas fireplace can add value to your home. According to the Residential Cost Handbook, a gas fireplace has the potential to add an average of $5,900 to the value of a home. It’s a win-win investment. Check out all the options and models here.